Initially I installed Andrew’s VAMP image from the SqueezeBox for under $30 tutorial. Many thanks to Andrew for writing that tutorial. Without it, I doubt I would have started this project. But the VAMP does not support my WiFi dongle (at least not out of the box). I also didn’t like the find-my-VAMP web service, which periodically dialed home to myvortextbox.com with the IP and MAC addresses of my PogoPlug. In hindsight I realize that the WiFi driver probably could have been installed in the VAMP image, but my initial research led me to believe that I needed a 3.x Linux kernel. Many hours on the Debian forums over at doozan.com finally got me up and running on Debian Wheezy with a 3.2.0 kernel. Enable SSH on the PogoPlug and flash the uBoot. WARNING be sure to have your PogoPlug connected to a stable power source while flashing the uBoot. If it loses power during that process it could become your next door stop (bricked). The forums at doozan.com, especially davygravy’s post on uBoot, should have all the information you need in this department. My PogoPlug would not boot with a 3.x kernel when I set the â€œmachidâ€ uBoot environment variable. I spent hours trying to figure this out. With netconsole enabled I could watch the device start up and load the kernel and initramfs images, but then it would just hang. There were no boot logs in /var/log, so I had no idea what was causing it to hang. It was only through trial and error that I finally arrived at the solution, which was to remove â€œmachidâ€ from the uBoot environment. I also set the â€œarcNumberâ€ to â€œ3542â€, the appropriate value for my E02 PogoPlug, which is supposed to make the light on the front change colors depending on the boot status (with appropriate scripts). It does not work though. I believe it would require a recompiled kernel to fix it, but it doesn’t matter enough to me to go to that bother. The source switch is nice because it allows a single input source to play at a time. However it’s inconvenient to open up a web browser to make the switch. My 4th generation iTouch is a little slow to launch a browser these days, so it takes longer than I’d like to do this. Luckily it’s not something I do often, so it’s mostly just an annoyance. A physical switch would be nice as well, but probably hard to implement. Auto-switching when an audio signal is detected could be nice if implemented correctly. Maybe I’ll try to do that sometime. Various operations such as changing sample rate, input source, or turning off squeezelite cause a click in the outputâ€”sounds like the waveform got chopped. It’s not terribly loud, but it doesn’t sound nice. I’m not sure what would need to change to fix this issue. Maybe it’s something in the way I have ALSA configured? Cannot listen to sample rates above 48KHz (or any rate not supported by the UCA-202). A different sound card that supports more/higher sample rates would be one way to fix this issue. Another solution would be to bring resampling back into ALSA, but that is likely going to be tricky (it should not resample when the rate is supported by the sound card); probably not an ideal solution. Latency is an issue when there’s video involved. It is low enough that it’s barely noticeable when watching TV, but it’s not perfect. I looked into using JACK, but the PogoPlug does not have hardware floating point support, so that doesn’t seem to be an option. Eliminating dmix definitely helped. I’d be interested in tips on how to reduce latency even more. Setting the various latency options for squeezelite and/or alsaloop below 50ms, or even 100ms in some cases, results in choppy sound and high CPU load. Maybe other adjustments are needed as well to bring latency down? 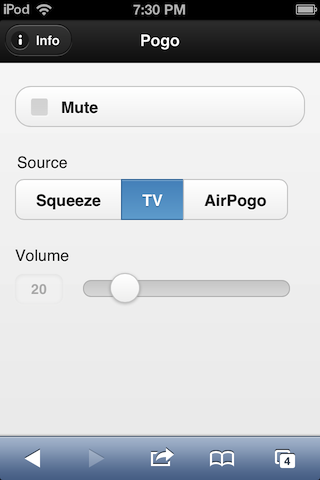 Very high latency with AirPlay streams. ShairPort seems to have pretty nasty latency. Maybe I don’t have it configured correctly? Maybe this is inherent in the AirPlay protocol? This is not an issue when listening to music in iTunes. But watching a video is agonizing. It would be nice if this could be improved, but it’s not a high priority for me at this time.